A long time ago, there was a kingdom ruled by the fair king, Arnor. He had a most beautiful and clever daughter, princess Dala. Noble lords from many kingdoms begged the King for his daughter's hand. But, no one was good enough for his Dala. However, in absolute secret, the young blacksmith Finn and Dala were in love. Until one day their secret love was revealed! King Arnor was furious! 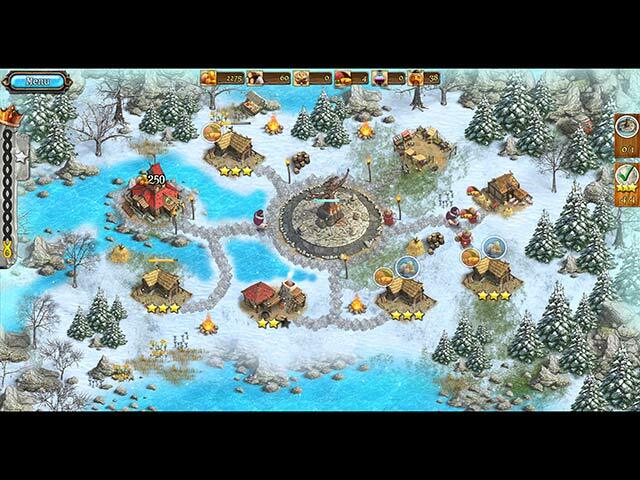 Join the expedition of the king's builders and architects on their noble quest! Explore, gather, produce, trade, build, repair and work for the wellbeing of all of your subjects! But watch out! Greedy count Ohli and his spies never sleep! Kingdom Tales 2 is rated 4.3 out of 5 by 58. Rated 5 out of 5 by joannes0 from Fun game I love this series. Cute and fun with just enough challenge. Hope they make more. 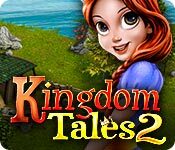 Rated 5 out of 5 by wannarenee from Kingdom Tales II Enjoyed this game very much. Its fun and my granddaughter loves to play as well. Family game. Rated 5 out of 5 by Koumes from Fun Game It's nice to have a challenge, but one I'm able to meet within a few trys. This game is fun, but not so hard that the casual player doesn't have a chance. Rated 5 out of 5 by marnold6 from Loads of fun Entertaining game that is enjoyable to play! Rated 5 out of 5 by graceland9 from Vikings in Love Finn has to rebuild the kingdom in order to win Princess Dahla before the evil Ohla catches her! In order to complete the task, Finn has to build cottages, repair roads, build farms and workshops, all with an unlimited number of workers. If you've played this developers' TM games before, you'll recognize the elements in this one. There's a hidden treasure in each, and you find it by clicking on the sparkles (always fun!) Collect rent for money and for special tasks like rebuilding memorials. You have to meet all the tasks within 'Odin's Time' to get the full star. There are money wheels to try your luck on, gold to be mined, and bridges for repair. I always enjoy these TM's. Even though they're challenging, I don't feel stressed out since there are always unlimited guys to carry out your tasks. My only complaint was the lack of Viking-specific tasks, although those might come along later in the game. I'd love a few Longships to launch or Valkyries to build temples for, but maybe I just didn't reach those levels yet. If you enjoy TM's with lots of construction and logical ordering of tasks, this is a definite Must. Rated 5 out of 5 by hotchchick911111 from fun time management game I loved it. I only wish that the trial (1 hr) was longer. Rated 5 out of 5 by depaho from This is the game to challenge TM lovers! It keeps you thinking, or you won't make three-stars. I managed to get 3 stars on every level (at normal setting), but only because I had to replay and adjust my approaches over-and-over! The story-line may entertain younger players, but it pays to read the little hints which precede the story chapters. So don't just wait for the "Click-to-start", read and remember because there is no "Help" button to keep you sane. I will look to see what else in TM this publisher has to offer, hoping their other offerings are as well done. Rated 5 out of 5 by nscottderr from Lots of fun; I recommend Cute characters and light challenge.